Kate Tempest. Performance & Page Poet. 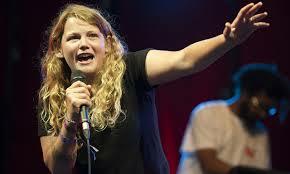 Kate Tempest (born Kate Esther Calvert, 22 December 1985) is an English poet, spoken word artist and playwright. In 2013 she won the Ted Hughes Award for her work Brand New Ancients. Tempest first performed when she was 16, at open mic nights at Deal Real, a small hip hop store on Carnaby Street in London’s West End. She went on to support acts such as John Cooper Clarke, Billy Bragg, Benjamin Zephaniah and Scroobius Pip. She toured Europe, Australia and America with her band ‘Sound of Rum’ and worked with organisations such as Yale university, the BBC, Apples and Snakes, The Old Vic and the Royal Shakespeare Company. Tempest has performed at such venues as the Glastonbury Festival, Latitude, The Wandering Word tent at Shambala, The Big Chill and the Nu-Yorican poetry café, where she won two poetry slams. Her first poetry book was Everything Speaks in its Own Way, followed by her first work of theatre, Wasted. At 26, she launched the theatrical spoken word piece Brand New Ancients at the Battersea Arts Centre (2012), to great critical acclaim.The piece also won Tempest the 2013 Off West End Award (“The Offies”) for “Best TBC Production”. Tempest’s influences include Virginia Woolf, Samuel Beckett, James Joyce, W B Yeats, William Blake, W H Auden and Wu-Tang Clan. In 2014 she released the album Everybody Down (Big Dada), which was produced by Dan Carey and was nominated for the 2014 Mercury Prize. Harry Baker UK Grand Slam Performance Poet. The Holloway Series in Poetry Presents at Poetry Videos Artvilla. Thomas Kinsella. The Dublin Writer Festival & Poetry Ireland.